so, we’d gotten wind of the 40th anniversary celebration mellow mushroom was having last night, and apparently so had the rest of the city. i arrived at the brookhaven location and looped the parking lot three times to squeeze into a spot, all to find out that a table for a party of five would be a two and a half hour wait. tWo AnD a HaLf HoUrS?! yes, you read that correctly. i like mellow mushroom just fine, but $2.50 small cheese pizzas and $0.75 pbr’s just couldn’t keep me. instead, nathan and alison recommended we try the burger place lucky’s just up the road in town brookhaven. a new restaurant in exchange for an overpacked (and overhyped) mellow mushroom? count us in! and folks, let me tell you this much right now. this post isn’t just about lucky’s. it’s also about cheeseburger bobby’s, the burger joint kyle, bank, and i ventured to for lunch today up in norcross. it was my first place at both restaurants, and having had them in nearly back-to-back meals, i figured it would be fun to find out which one reigns supreme! 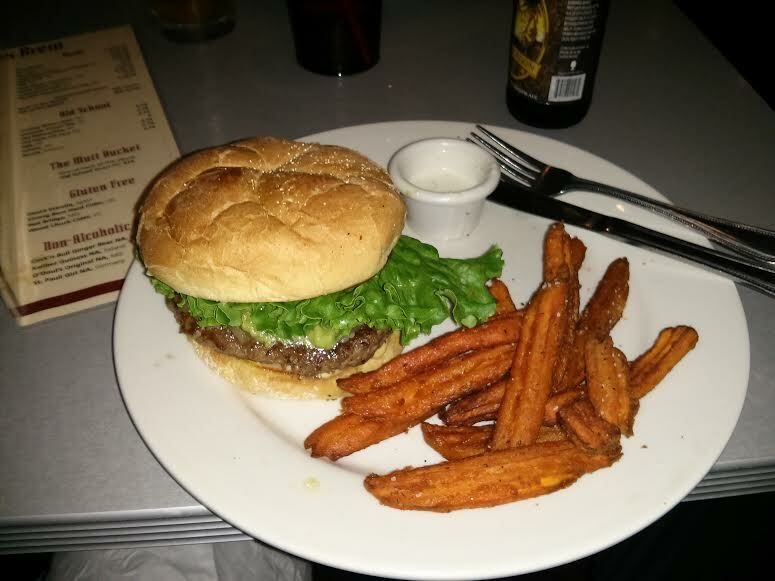 i’m almost always in the mood for a good burger, so i was looking forward to some juicy, meaty goodness at lucky’s. upon arriving i saw the patio. and on the patio were people. and with those people were PUPS. pups of different breeds and sizes just hanging out with their people. things always work out for a reason, don’t they? i agree! something that makes lucky’s so unique is that it is dog-friendly out on the patio, with water bowls and treats for our furry friends. the restaurant’s namesake is owner ernie geyer’s golden retriever lucky, who has called ernie and his wife diane family since five years ago. ernie has been working in restaurant construction for over 25 years, and his dream of opening his own burger place with delicious food, cold brews, and big tv’s came to fruition when the first lucky’s opened up in roswell in 2010. the menu at lucky’s is extensive and charming with its options named after some of your favorite dogs like the poodle chaser and russian wolf hound. although our group was quite hungry, we had to start somewhere, and drinks and appetizers seemed like a good spot. jon went with an arnold palmer, but instead of regular lemonade, they only had pink lemonade. jon is so kind that he said, “okay, then!” such a trooper. he took a sip when it arrived and could not hide his expression from his face. “is it any good?” i asked. “you know, it’s quite stiff but not bad at all.” he let me have a taste, and i have to agree. i don’t even like arnold palmers, but that drink could keep you happy for a few rounds. good call, bartender! alison went with a classic, corona light, and i couldn’t pass up having the oldie but goodie golden ale from terrpain. gotta support those local breweries! 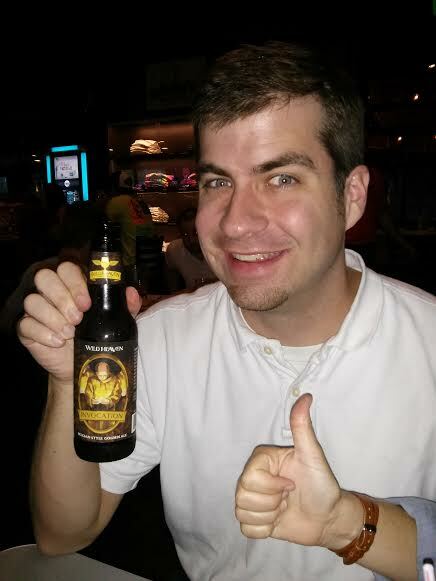 nathan enjoyed the wild heaven “invocation”, which the restaurant claims is from north carolina but which nathan is convinced is just down the road in decatur. in case you were wondering, it is from avondale estates, the neighborhood just east of decatur. 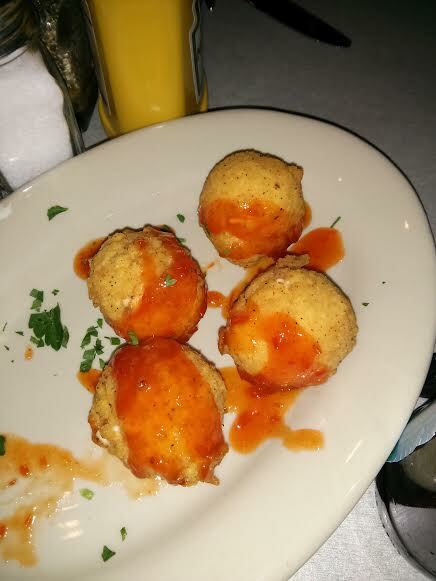 lucky’s – 0, nathan – 1.
jon is a diner after my own heart, spotting the fried pimento cheese bites and hesitating not a moment to order some for the table. although they arrived at the same time as our burgers (appetizers should arrive first, yes? ), they were well worth the wait. those little pockets of heaven were so piping hot that the pimento cheese filling really was melting in my mouth. the spicy pepper jelly was the perfect condiment atop the bites. i have no shame in admitting that jon and i kept them to ourselves…okay, maybe i feel a little bad because they were so darn delicious. i suppose we’ll just have to go back sometime for another round! the burgers arrived swiftly all around us. we rolled up our sleeves and got busy. those burgers weren’t going to eat themselves! we’ll start with mister jon, who dug into the memphis blood hound so quickly that i couldn’t even snap a picture of it on the plate! the bbq sauce was sweet and flavorful atop the patty. the bacon was a great addition, but he wishes he’d left off the bread’n’butter pickles, a taste for which jon doesn’t particularly care. overall he really liked the burger, but he might have even liked the sweet potato fries more. those fries were thick cut and crispy, and i would admit, if you were to ask me, that they are some of the best sweet potato fries i’ve ever had. alison suggests dipping them in bleu cheese while her husband nathan prefers to slather them in ranch. either way, i really don’t think you can go wrong. rounding the table, we come to nathan, who had the chihuahua. such a small dog for such a big burger! nathan liked the southwest theme of the burger, but it thankfully was not too southwestern. to put it another way, it wasn’t like he was eating a taco on a bun. well, that’s a relief, because tacos belong in tortillas! i’ll mention here that wednesday nights at lucky’s are actually trivia night. despite arriving late, we hopped in at round two to join the fun. at the end of the night we were near the bottom of the pack, but that doesn’t mean we didn’t do some learning! we found out that the construction of the berlin wall began in the 60s, that new york city’s nickname gotham was given by washington irving in the november 11, 1807 periodical of his salmagundi, and that there are recurring incidents of characters on the simpsons that smoke laramies. who knew! all that thinking makes my appetite grow, so let’s get back to the food. jamie went with the boxer after taking a moment to find out exactly what boursin cheese is; and in case you were wondering, it’s a soft and creamy french cheese that often mimics cream cheese in its texture and flavor. she really liked the boursin and the minimal schmear of dijon mustard. it was just enough for some taste, but it wasn’t too overpowering, which she greatly appreciated. 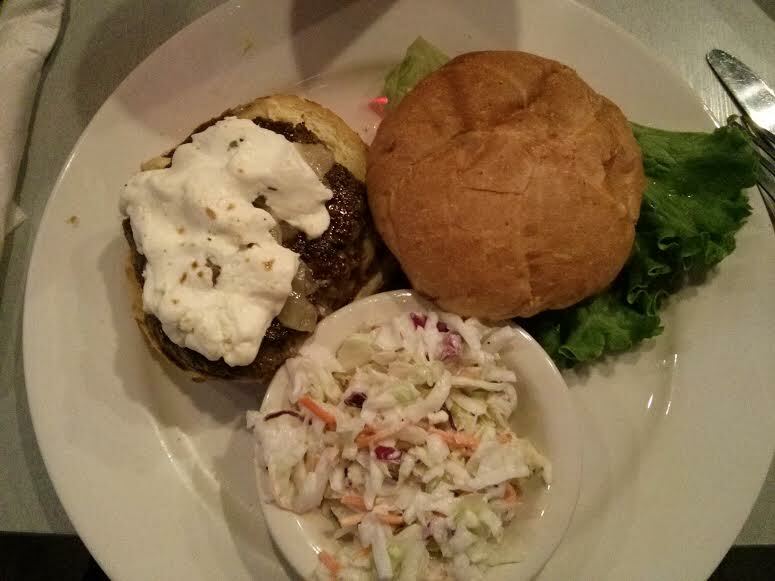 the side of coleslaw was a nice light pairing with the filling burger. finally, we get to the german shepherd burger, the one alison and i both gave a try last night. i mean, candied bacon jam and cambozola doesn’t sound like a bad idea, right? well, i’d say it was a great idea for the first few bites, but then it became too rich. i know that neither alison or i finished the whole burger. i wanted there to be less cambozola and more jam, and alison felt the same way. even though we would liked to have eaten the whole thing, we weren’t brokenhearted that we couldn’t. oh, and i ordered the parmesan parsley fries in place of the regular ones. i warn you right now that they were not worth the extra buck or so. they weren’t as fancy or special as they sounded. despite the enticing idea of dogs and burgers and brews all in one place, i have mixed reviews of lucky’s. the service, although friendly, was quite slow. we weren’t checked in on regularly, and i didn’t feel like anything but another customer in their restaurant. and besides the darling dog pictures lining all of the walls inside, there was nothing special about the atmosphere. it’s a restaurant and a bar and doesn’t feel like too much more than that. perhaps most “disappointing” (although i really hate to use a word that sounds so negative) was the fact that i know i’ve had better $11 burgers in the city. oh well, i guess they cannot all be winners, right? i don’t expect myself to be rushing back to this restaurant on my own accord, but perhaps on a different day with a different burger, i might feel differently. now, let’s fast forward to this afternoon: my brother hadn’t brought lunch and was itching for a burger. 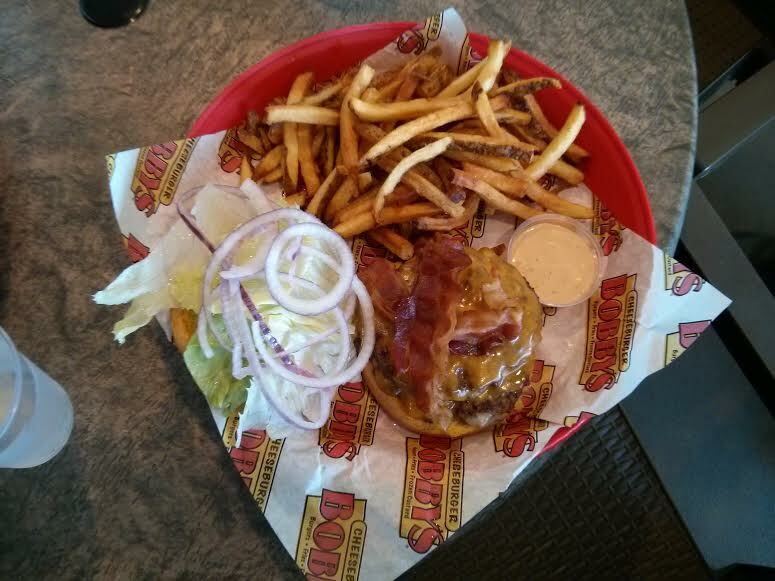 thank goodness cheeseburger bobby’s is nearly a stone’s throw away from our office! we piled into bank’s car and zipped on over there. i had heard about and seen this place plenty of times but never dined there. sounds like a good day to try something new! when we walked inside, things weren’t what they expected. i don’t know what i was expecting, but what i saw wasn’t it. now, i don’t make this statement at all with a disappointed tone. perhaps i was picturing something like steak’n’shake? i’m not sure, but i now know that cheeseburger bobby’s is a fast-casual restaurant, where you place your order at the counter and pick it up when it’s ready. once you have your burger or sandwich or hotdog, you can take it on over to the “build your own burger” bar and throw on all the toppings your heart desires. kind of a neat idea that keeps folks from wasting all that lettuce, tomatoes, and onions that no one ever seems to actually want. cheeseburger bobby’s prides itself on using only the freshest ingredients, and i can say that i took notice. the fries were fresh and hand-cut and seasoned very well. and although i didn’t get anything from the “byob” bar, i took a look as i passed, and everything was quite green and looked very crisp. 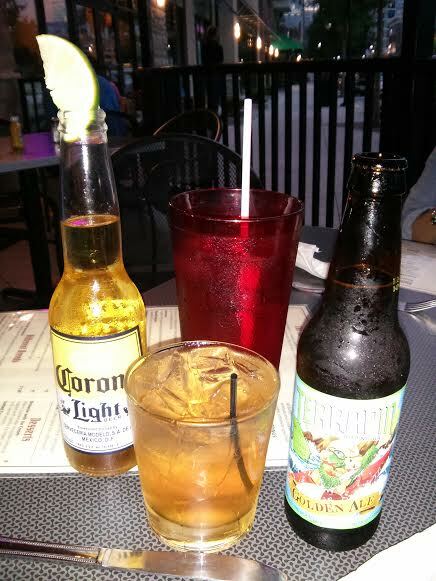 our burgers were ready quickly, so we grabbed our sauces and drinks and snagged a table on the covered patio. it was a warm day in norcross, but at least the shade kept things cool as we ate. bank had the mushroom and swiss burger, and those cooks were quite generous with the mushrooms. i like mushrooms just fine, but that was a pretty large heap on top of that patty. good thing it was his meal and not mine! kyle went big with the double bacon cheeseburger. he must have been a hungry fella because he ate every last bite. i admit that it looked quite indulgent. following last night’s semi-loss at lucky’s, i wanted something classic and tasty, something that i knew would satisfy. the smokehouse burger spoke to me, and that’s the one i ordered. 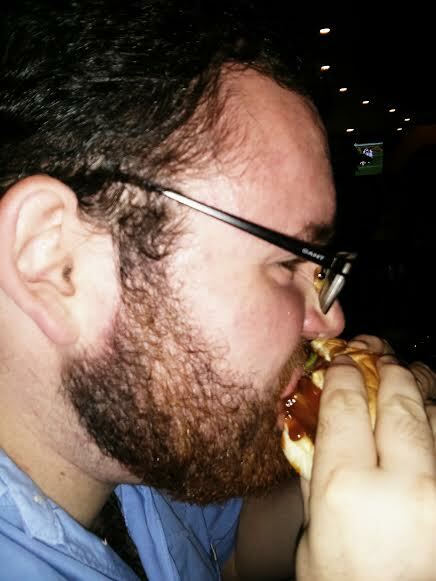 i really loved that the burger itself wasn’t monstrous. i mean, it was just a lunch burger after all, and i had a full afternoon ahead of me at work. the sweet ray’s bbq sauce was a great condiment for the burger, and the bacon and cheese were obvious choices. apparently i was hungrier than i thought because i ate the whole burger and almost all my fries! as our lunch was winding down, one of the employees came out with custard samples. cool, creamy custard on a hot georgia day? what a great idea! it’s a good thing i was already full, because that custard was so delicious that i could have easily ordered myself a whole bowl of it. 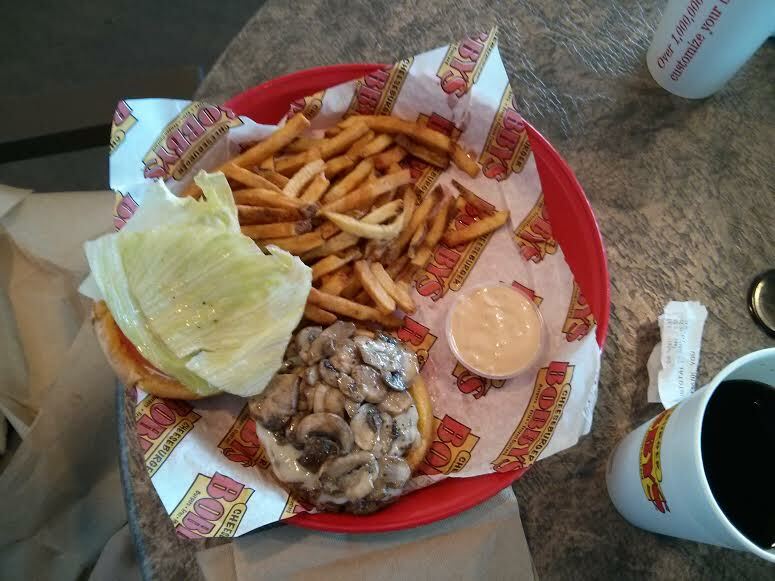 so, it all comes down to this question: which burger place do i like more, lucky’s or bobby’s? more creative or more classic? more expensive or less expensive? i’m betting by my review you already know that i liked cheeseburger bobby’s more. it’s a solid burger of great quality. the service was kind and to the point; they don’t mess around here. although i might be “burgered” out for just a little bit, i would gladly accompany you at bobby’s, probably not recommend lucky’s, and certainly join you in trying any other new burger place in atlanta that i have not yet discovered.